Recession? What recesssion? 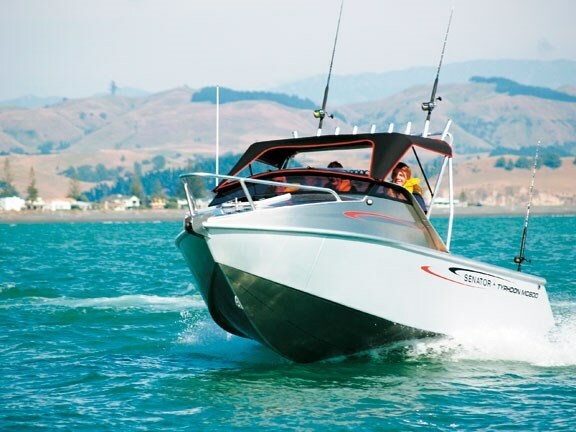 Senator Boats has released its second new model in less than six months, so Lindsay Wright went along to sample what could become the Napier company’s crunch buster. At a time when some boatbuilders are retrenching or laying-off staff, there’s a new sense of purpose at Senator’s suburban Onekawa premises these days. Best known for its shapely pontoon boats, the company parted ways with its erstwhile marketing arm, Firman Marine, earlier this year and is branching out with a network of dealers throughout the country. The boat being used to launch Senator’s new monohull range is the Typhoon. A 670 Typhoon hit the water in late July (see Trade a Boat August 2008) and the latest is the tidy Typhoon MC 600. For a start, we ran a tape measure over the boat while she sat on the DMW Premier Series trailer in the yard and found the hull length actually measured out at 6.15m. "An extra bit of boat for your money," says national sales manager Murray Thomson. The MC 600 (Monohull Cuddy) is already a fair bit of boat for your money, with a generous beam of 2.38m carried well forward into the shoulders of the boat. "Here in the Hawke’s Bay, the land breeze normally kicks in during the afternoon," says Thomson. "The bay’s relatively shallow, so it whips up a steep little chop. We designed the 600 so that three big guys could stand comfortably under the soft top and five to six people could fish comfortably from the cockpit…but she will still get up on the plane at relatively slow speed to punch home at the end of the day." Hull design is almost identical to Senator’s 620 pontoon boats. The company has built 185 of the popular 620s – most of which are one-owner boats and rarely come on the market. 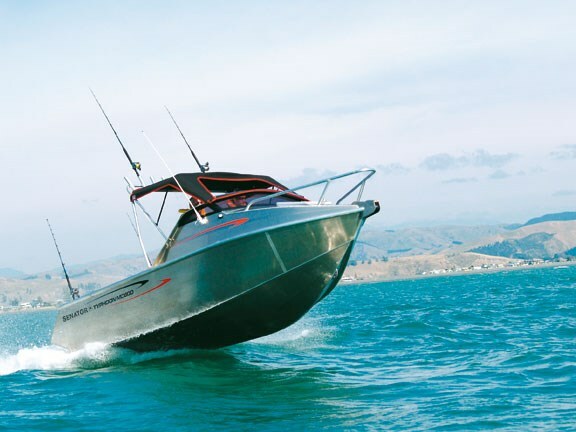 The MC 600’s single chine has a turned down, or "gull wing", effect to provide lift and the variable deadrise tapers from 18 degrees at the transom to around 26 degrees near the bow. Bashing out of Napier’s Iron Pot boat harbour, the MC 600 has a team of three aboard, and it’s hard at work straight away, head-to-head with a steep sea whipped up by a few days of 25-knot easterlies. 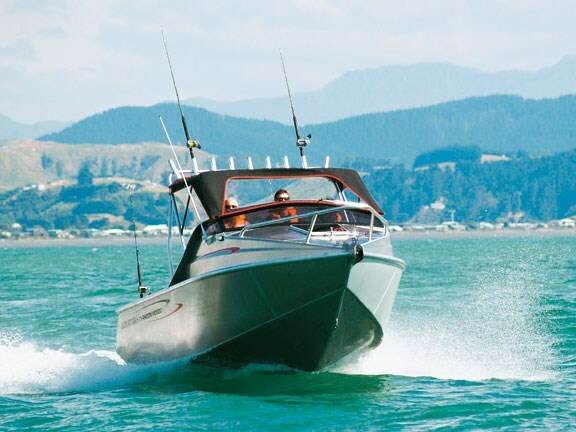 We crank the 130hp two-stroke Saltwater Series Yamaha up to about 3600rpm and the boat fulfils her design brief straight away, heaving herself quickly out of the hole and on to the plane at a relatively leisurely 28km/h (15 knots). We didn’t get the conditions to really wind the Yamaha out, but Thomson says in flat water they’ve had the engine at 5900rpm (72km/h – or 39 knots). Engine and boat are a happy match but Thomson says, for owners who want to go quicker, up to 200hp could be attached to the closed engine pod on the Portofino stern. More horses would make it easier or move a team of divers and their gear at speed. Fuel is drawn from a 200-litre under-floor tank, which is stitch welded to the cockpit beams, pressure tested and has a fuel containment area (as per Maritime New Zealand survey regulations) to segregate any spillage. An expansion chamber in the top of the tank is vented into the filler fitting on the transom gunwale. 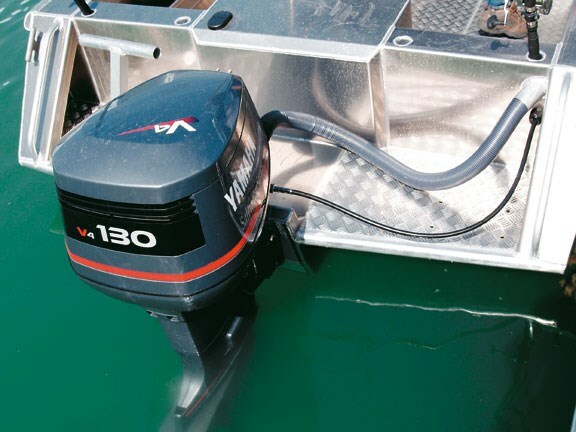 The battery, battery switch and two-stroke oil tank are neatly (and more importantly, accessibly) stowed behind a waterproof hatch in the transom. A nuggety piece of specially-fabricated aluminium channel holds the 6mm thick tinted polycarbonate widescreen – and it makes a favourable first impression. The raked windscreen sends the brisk wind over our heads and the soft top is taut and flap free. The same standard of construction starts at the bottom, where 5mm thick hull plating is stiffened by two channel sections that run right from the 6mm transom to the aft end of the bunks in the cuddy. Topsides and cockpit sole are 4mm thick and a sturdy half round aluminium pipe section acts as rub rail. "We’re not scared of going alongside anything with these boats," says Thomson, "and it gives yachties fits." A rakish and substantial 30mm handrail curves round the bow. The cockpit gunwale tops 750mm and, make no bones about it, the MC 600 is set up for seriously committed fishophiles. There are no less than 10 rod holders set into the gunnels and the rocket launcher boasts a battery of nine and potential for some serious high-density trolling. Deep, stitch-welded shelves line the cockpit and the under-floor storage area would fit three dive bottles or a good day’s catch, with room to spare. It can be flooded through a screw-in bung at the aft end. The test boat doesn’t have one fitted, but Thomson points out where a live boat tank would go and the bracket on the transom for the pump to run it. 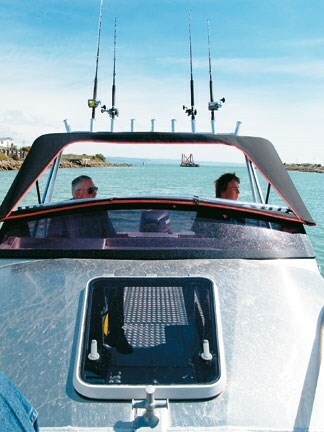 Likewise, a step-through transom and a serious boarding ladder (different from the standard, one-rung version), can be fitted for the folk who get their fun from diving. 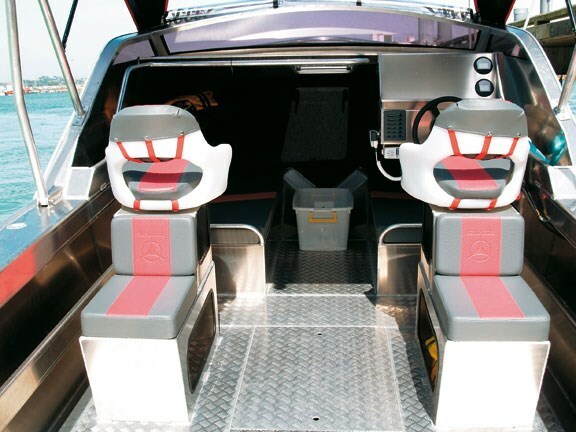 Senator has had a long association with Charman Motor Trimmers and Upholsterers, which produces the stylish red and grey vinyl upholstery and deep grey outdoors carpet that lines the cuddy cabin. The bunk squabs are plywood-backed and velcro down so they can be easily removed to provide access to the full-length stowage bins below. Long carpeted ledges give secure storage down the side for domestic knick-knacks and also stiffen the hull plating. The tinted Weaver hatch floods the cuddy with light and can be opened for he-who-heaves-up-the-anchor at the end of the day. 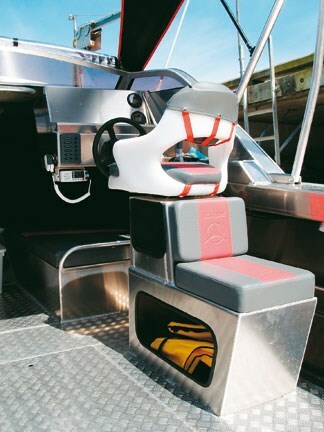 The MC 600’s standard seats are solid moulded 3000 series Hi-Tech Plastic models from Hamilton and are mounted on welded aluminium pedestals with lifejacket-sized stowage in them. It’s a bit of a stoop to reach the Uniden VHF, but the Teleflex steering wheel falls easily to hand and the non-feedback system gives good, positive control over the boat’s direction. The standard Yamaha 703 cable controls also fall readily to hand. Senator’s test boat has basic Yamaha instrumentation but there’s a heap of room on the wide shelf above the dash to fit any number of flash electronics. The shelf’s raw aluminium and, given the tendency for accumulating bits and pieces that most available storage areas have on a boat like this, carpet or rubber matting would be fairly essential rattle-proofing. It’s hard to make a pontoon boat attractive but Senator somehow manages it, and the company’s design experience has also been applied to this Typhoon. The flat side of the cuddy cabin, which can look so ugly on many boats, has a rakish crease through it and is enhanced by the graphics (supplied by Instant Stripes and Graphics). There’s a lot of alloy in the little Typhoon and we hold an informal sweepstake on what she weighs. Running the boat and trailer over the weighbridge at a local trucking firm brings it in well under the nearest guess at 1460 kilograms. Napier is Senator city. Paul Willhouses’ new hunting and fishing franchise has an 8m Senator protruding from the shop wall with a display of fishing gear around it and a walk through the local marina is like strolling through slice of Senator history. "That’s our original 10m Offshore," Thomson points out, "it’s 13-years old and still has the same owner…mind you, he’s on his second wife." Further down the dock is a new Senator 15m catamaran powered by twin Volvos driving surface-piercing props. Back at the purpose-built factory, a slightly bigger sister ship with Scania-driven jet units is being built for a commercial fisherman client from the Wairarapa. There’s also a nifty 620 pontoon boat with full cabin and swing down boarding ladder on the bow for beach landings. She will be fitted out by her Timaru owner for cruising the southern lakes and Fiordland. "And here’s one of our old faithfuls," says Thomson, patting the bow of a new 620 hardtop. About 250 of the 585 and 620 Senator pontoon boats are in use by commercial and recreational operators throughout New Zealand. "People smack ‘em into rocks and stuff, but we’ve never had a warranty claim for structural work." The new Typhoon is another addition to Senator Boats’ line up of user friendly and classically timeless vessels.